Have you ever worked with loop yarn? It’s almost like finger knitting in that you don’t need needles, and almost like crochet in that you are kind of hooking loops into each other. I wrote a post about the basics of working with loop yarn over on Our Daily Craft last month, and I’ve been on the lookout for different ways to use the yarn since. 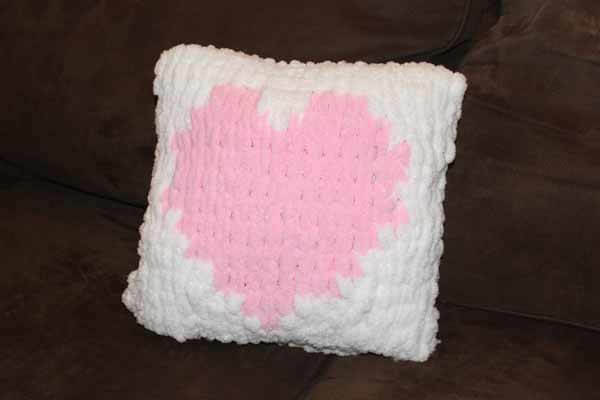 This heart pillow using loop yarn is an original design by a member of Needlepointers.com’s staff. She enjoys knitting with loop yarn because it requires no knitting needles. Since Valentine’s day is fast approaching she wanted to make a heart pillow and this is the design and technique she came up with using loop yarn. It’s not much more difficult to add a second color to a loop yarn knitting project, and the post includes a video tutorial to make it even easier. If you have used loop yarn I’d love to know what you made with it!